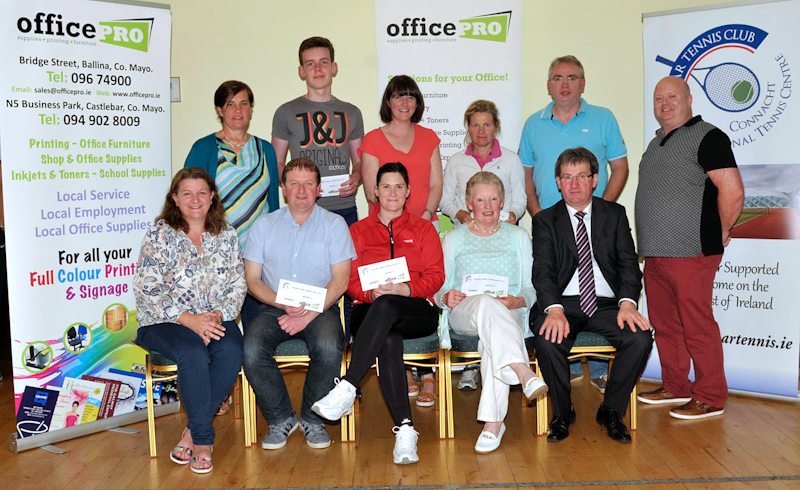 Pictured in Castlebar Tennis Club at the Spring League Competition sponsored by Office Pro, Castlebar & Ballina, winners section B front l-r; Noreen McNamee, Chairperson, Pat Conlon, Gerry Moane, Mary Ward, Gerry Curley, Director Office Pro. 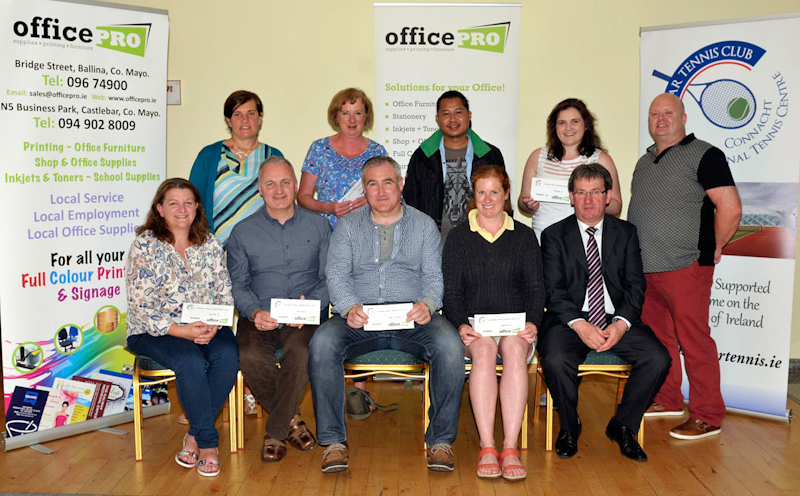 Runners up back l-r; Terese Ruane, lady captain, Bernie Walsh, Po Kho Lay, Sarah Ronayne, Jason Guthrie, men’s captain, missing from photo John Greenan. Photo © Ken Wright Photography 2015. 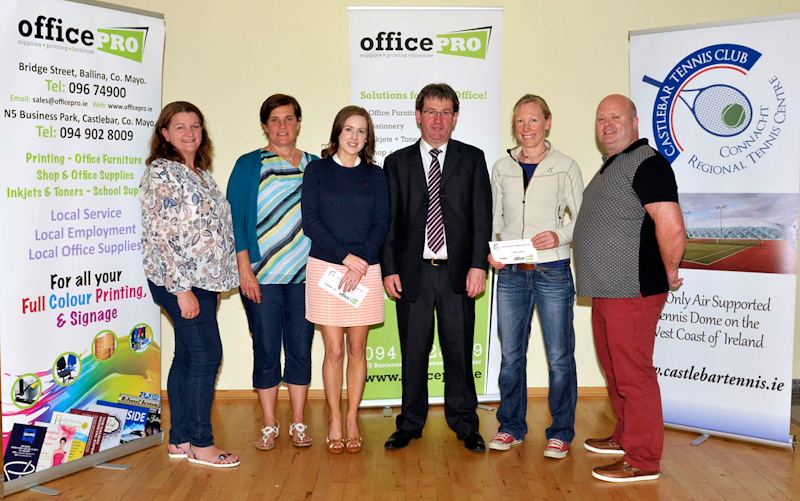 Pictured in Castlebar Tennis Club at the Spring League Competition sponsored by Office Pro, Castlebar & Ballina, winners section A front l-r; Noreen McNamee, Chairperson, Brendan Murphy, , Niamh Kilroy, Bernie Bourke, Gerry Curley, Director Office Pro. Runners up back l-r; Terese Ruane, lady captain, Cian Tighe, Grainne Cashin, Emma Buckley, Neil Ferriter, Jason Guthrie, men’s captain, missing from photo Darren Fernandez. Photo © Ken Wright Photography 2015. Pictured in Castlebar Tennis Club at the Spring League Competition sponsored by Office Pro, Castlebar & Ballina, winners of the mini league front l-r; Noreen McNamee, Chairperson, Terese Ruane, lady captain, Kate Delaney,(runner up), Gerry Curley, Director Office Pro, Lucie Hanaghan (winner) and Jason Guthrie, men’s captain. Photo © Ken Wright Photography 2015.